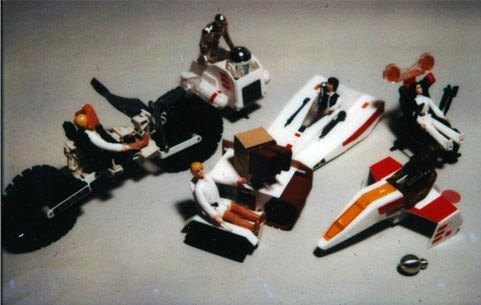 The Star Wars toy brand had several vehicles to choose from to help young boys and girls recreate their favorite scenes from the movie. With the impending release of The Empire Strikes Back toy development was underway to create such memorable vehicles as the AT-AT, the Snowspeeder, and Slave I. 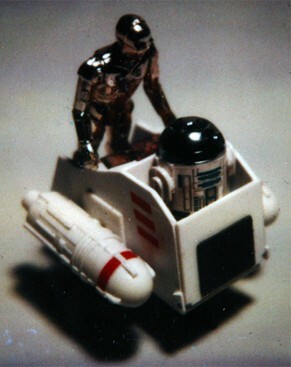 During this time period a new segment of the Star Wars brand was also created known as mini-rigs. The first question that comes to mind was; "how did the idea of the mini-rigs come about?". The answer is, sheer boredom. The creator of the mini-rig line was trying to come up with an idea how to create a set of low-priced vehicles. The goal was a line that would retail for $9.95 or less. It was thought that kids could more easliy afford that price point than the larger sized vehicles that retailed between $19.95 and $49.95, such as the X-Wing or TIE Fighter. So, the designer began scratch-building some concepts from found objects and several trips to the customer service parts bins. While the designer utilized parts created out of sheet styrene, and quite a bit of glue, no paint was used. Six vehicles were created, which can be seen in this polaroid image. Perhaps the most interesting of the six concept models is the "walking throne" for Princess Leia which is seen in the upper right corner of the image. The model had four movable legs that were linked together with fine rods. By using the tops of the two rear legs as levers all four legs would appear to "walk". The concept was ultimately rejected as it was thought that it didn't fit Leia's "go get'em" personality and she would never be seen using it. Interesting to note that the concept became reality over 20 years later. During Episode One Viceroy Nute Gunray is seen in a spider chair. Hasbro created a concept model for that chair which can be seen here. Taking center stage in the image is the concept vehicle that would eventually turn into the MLC-3 mini-rig. 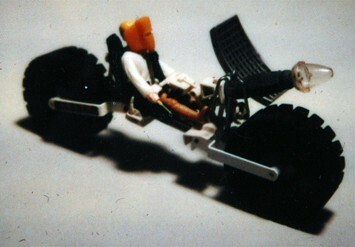 The model utilizes such parts as treads off of a radio controlled Sand Crawler. The small craft in which the Chewbacca action figure is sitting in is made completely out of styrene. The graphics were supplied by the decal sheet for the X-Wing fighter. The concept model in which the Han Solo figure is sitting in is also made completely out of styrene. The model is based on the front cockpit of the Y-Wing.fighter. The following image is a closer look at the concept model that would eventually become the PDT-8 mini-rig. Right away you can see that the engine pods are donated from the die cast Y-Wing. In addition, the landing gear from the diecast Y-Wing was also used. An early mock-up box for this mini-rig surfaced several years ago and a point of interest worth noting is that the original name was intended to be DPT-8, short for "Droid Personnel Transport". Some interesting pieces were utilized to create this kitbashed example of what would eventually become the MTV-7. Pieces such as the seat in which Luke Skywalker is sitting in is the gunner seat from the Millenium Falcon. The designer cannot recall what tires were utilized but believes that they may be R/C wheels that were in one of the drawers. It's interesting to note the lightbulb located on the vehicle. The designer attempted to include a light-up feature that would have required the use of one double "A" battery. Because they could not get the idea to work, it was eventually scrapped. A mock-up box for the MTV-7, similar to the PDT-8, also surfaced some years back showing yet another step in the development of these early EU vehicles. In this image are examples of the MTV-7, MLC-3, and PDT-8. These three examples are hand-built models that were created in Kenner's model shop. Upon looking at the body of the MTV-7 one should take notice that some differences in detail are present. This model shown, though much closer to the production design than the first concept, is still an early model and lacks some of the finer details of the production version. The PDT-8 is clearly stylized closer to the concept model than the final release version, as can be seen just in the size difference alone. The basic structure of the MLC-3 is also there but as with the MTV-7 the difference in detail can clearly be seen. For example, there is no flip-top door. This is yet another step closer to what finally shipped to stores though. Both photo-art and a cromalin exist for the final packaging of the MLC-3 showing yet another step in the lengthy development process of a toy. 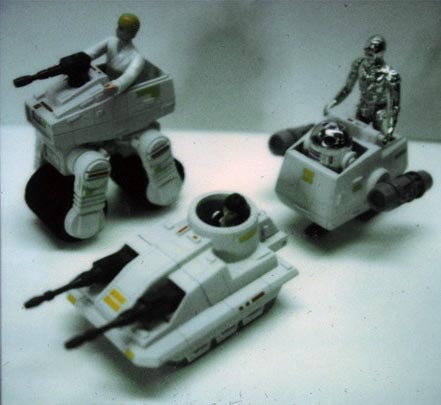 During the POTF2 era mini-rigs in essence made a return, only this time being called "Deluxe". 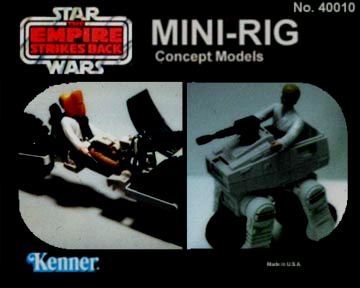 The mini-rigs were the original toys for an "Expanded Universe" concept, a concept which Kenner wouldn't utilize until well into the 1990's when the Star Wars toy brand was revived.